It's over two years since we released SOMA, so it's time for another update on how things have been going. First of all, let's talk about sales. As I've said many times before, sales are not straightforward to count, and the number you come up with is reliant on many different factors. For instance, SOMA was part of the Humble Monthly Bundle, which meant that everybody subscribing to that service was able to download a copy of SOMA. These are not really "sales", so should we count them? It's also worth noting that pricing differs a lot between different sales. A single unit sold at full price means more than one sold when the game is 75% off. I think it's important to think about these things, and remember you can't directly compare the sales of two games. With all that said, what I'm going to do here is to basically take every single download of the game as a sale. Doing so gives us a total of 650 000 units, a 200 000 units increase since the the same time last year. This is a very good result. It's interesting to compare how sales have changed across the two years for SOMA. The normal day-to-day income, when there are no discounts or anything, is 33% of what it was the same time last year. However, when the game is at a discount (such as a Steam summer sale), the generated income is about 75% of what similar events generated last year. This means that discount events are extra important this year. Taken as a whole, the sales that we make from all our games will cover all our expenses every month, and even make us a profit. This is quite amazing. Given that we currently have about 16 people working with us full time, we have a pretty high burn rate, and to still be able to support all that on your ongoing sales is great. This means that we still have a good buffer from our launch sales. While it will by no means last forever, it gives us peace of mind and lets us take the time we need. While we'll continue to generate income next year too, I'm not so sure it'll be enough to cover all our costs. This is when that initial buffer comes in handy, and will let us continue working on our projects without any monetary worries. To put things in perspective, it is worth noting that most companies start using up their buffer just a few months after release, so we are in no ways in a dire situation right now - quite the opposite! However, this also makes it very clear that we need to be able to release games at a more regular rate. We were lucky that SOMA was a hit, and that the money is easily able to sustain us for the time we need to complete our next project. Had SOMA been a flop, the situation would have been a lot worse now. That's why we are focusing on becoming a two project studio, and the goal is to be able to release a game every two years. Had we managed to set that up prior to SOMA, we would be in the process of releasing a game right now. Needless to say, it would makes us a lot more financially stable, and able to handle a less successful release. In turn this should allow us to take greater risks, which I think is a key element in being able to create great games. This leads me to another thing that's been on my mind. A few months back someone asked me: "How do you get people to buy your game?". This is a fairly basic question, but it really made me think. When it comes to sales made during launch, the answer feels quite self-evident. We generate a lot of buzz, there are reviews, let's plays and so on. There are a number of fairly obvious ways that people learn about our game. But what about the customers that buy our game two years after release - why do they do it? That's a much harder question. I think most of this is via word-of-mouth recommendation. When the right circumstances arise (e.g. : "I feel like playing a game tonight") and when external influence (e.g. : "your friends said they liked our game") is strong enough, that's when a sale happens. I know that Steam and other stores have some forms of discovery tools, but I don't think they play a major factor. What really matters is not a single source, but the slow build-up of good will around a game - eventually this will make a player consider buying it. Discovery tools, such as "you might also like"-adverts, surely help, but they are just part of a much larger process . Because of this, and considering the sheer number of games that are currently being released, I think the best strategy is to focus on unique experiences. You want to create the type of experience that is not only hard to get elsewhere, but also leaves a mark on those who play it. This is now a core philosophy here at Frictional. I guess we sort of always had it unconsciously, but we have now made it official. Our goal is to create games that are more than forgettable escapism. We want people to come out of their experiences feeling changed. A lofty goal? You bet. While it'll be impossible to make sure every single player has this type of experience, it feels like the perfect thing to strive for. Now I will round of this post with a brief discussion on the status of our current projects. The first project is in full production, and about 80% of the team is currently working on it. The focus for most of this year has been on creating the first few maps of the game to create a solid vertical slice based on our experiments last year. However, we recently came up with some new avenues that we wanted to explore. The stuff that has come out of this recent detour is feeling really great and I am certain it'll make the game feel very special. All of this came out of what I just discussed: our focus on making games that leaves a mark on the player. I'm not sure we would have gone down this route if we hadn't explicitly stated that goal, which makes me confident it's a really good way of thinking. I'm afraid I can't go into any details on this, other than to say that the project will be horrific in nature. There will be no release this year, but we hope to announce something during the first six months of next year. As for the other project, that's also going well. We've been a bit delayed due to new tech taking longer than anticipated to develop . The upside of that has been that the game has had more time in pre-production than any of our previous games. This has been incredibly valuable, as the things we aim to tackle in this game are quite difficult, and allowing it all to brew for a bit has meant many of the basic aspects are clearer for us. This game will be less about direct, visceral horror, and more about the player gaining an understanding of different concepts. This can, as we know from working on SOMA, be quite tricky to get right and requires a slightly different approach than when working on a more direct horror game. Release for this game is quite far off though, so don't expect to hear any concrete details in the near future. That's it for this update. I'm incredibly excited about the things that we have planned, and I'm very eager to give you all more updates. I also want to thank everybody for the support over the years, and rest assured that while we might not reply to every single mail, tweet, etc. that you send us, we make sure to read every single one! 1) For games that are heavily based around online communities, such as a Rocket League, I think things work slightly differently. There is still a word-of-mouth zeitgeist going on, but a lot of it comes from your game become a habit for your players, something that they participate in on a daily basis. This forms a feedback loop that helps drives new buyers, which I think is quite different from how our games work. 2) We are currently working on the fourth iteration of our HPL engine for this game, and due to some of the things we need to be able to do for the game, we've been required to make some major adjustments. These things take time, but luckily we have most of it done now. Yes yes yes! I totally agree and support this game design philosophy. Do not make franchises that churn out the same title year after year. Do not eek out every last drop of a game concept with season passes and endless new levels and upgrades. Make a complete work of art that will live on and only grow in renown. Cannot agree more with you! Well, SOMA was already that game. So obviously you have a fan for life in me. I am just glad you can comfortably continue creating and innovating. Congrats Thomas and the whole team! SOMA was amazing for being so different from the actual horror game styles. One that makes you think for so many time after you finish the game. I just played once, but I think about all the concepts presented on SOMA so many times during the year. But I want to see what you will come up next, I believe that P.T. created a new scenario for this kind of genre. We can see it clearly with games like RE7 and specially with Bloober Team's games (Layers of fear and Observer). I wish you the best. Congratulations with the result achieved at SOMA. It's the best sound effects game I've ever seen and the story is brutal. Quite a masterpiece. I wish I could invest in your game company. Love everything you are doing, so I am glad to hear things are going well for the next release. Can I just say I love you guys' love of Lovecraft? But that aside, I've absolutely adored everything you've put out so far, and I still think SOMA is one of the best games I've ever played. That ending just...man, it stays with you. Good luck and can't wait to see what you all do next! Could you sometime write a summary of how the changes the scripting engine (and the engine overall) have been reflected on the SOMA modding community compared to Amnesia? I didn't follow that closely what was going on in that area, but I'm interested to hear what you have observed. HPL3 is far more flexible in this regard, but also more complex, and it initially seemed that this could potentially be less approachable to the modders, who are generally not programmers. I know you made a deliberate effort to provide helper functions to make scripting similar to how it was done in HPL2. I'm really interested to read your thoughts on how it all worked out. I see there is a number of mods available for SOMA, but it looks like there's quite a bit fewer of them compared to Amnesia mods, even after taking the age of the games into consideration. This is not a bad thing per se, but it is interesting from a game dev perspective. I think that while we added lots of helpers that were same as the ones in TDD, I think that just having all of the new features made it confusing to modders. This is not the only reason though. I think the game itself (no easily placeable monsters) and the rise of engines like Unity and Unreal has made modding in general less interesting to people. Are you going to expand in VR and co-op experience with your future projects ? We would like to do some sort of VR project but don't have a lot of time, so have to choose carefully. If we do anything it would be something small. Co-op is something we are also very interested in. I have an idea for a horror co-op game that I think would be great, but also have other things I want to do. Dead Space 3 has amazing co-op experience. I know it's not regarded well for the fans of the original but nevertheless playing with friend is great. Single player too. Though, this is not good example for your work as it's action shooter. But, stealth game like Thief combined with puzzle adventure experience like Myst. Playing as single, player could knockout(eliminate) the A.I when undiscovered. When discovered, he's defensless. Pacing is in the tension of being lit and finding a dark spot. I think Amnesia would be appropriate for this kind of stealth element. In co-op, one player would run as a decoy to distract the enemy, while other player would need to solve the puzzle how to open the door so they can both escape. Also, the tension is there. Player at the door puzzle is lit so he must rely on other player who keeps the enemy away . Other player could use the shadows and try to knockout the enemy or just keep it away for the first player. You surely left a mark in me with Soma, and i'll be glad to add as many marks as you develop. Support for life, guys. Stay to your core and do what feels right, you have an eager audience. Can't wait for the next game! I am really glad you guys are doing fine! SOMA was one of the most amazing experiences games have given. Looking forward to your next games! I wanted to thank you for SOMA. It had its flaws primarily in pacing and enemy AI. But SOMA is my go-to example for how a video game can tell a story that no other medium can. Games can be "fun" in a way that movies and books aren't, but the -stories- they tell tend to be identical, with no discernible impact from the medium. SOMA completely smashed that, in my opinion. Everything from your perspective, gameplay choices, and even the *monster designs* themselves all served to reinforce the main theme "What does it mean to be human?" in a way that only games can. And in a true sense, I consider SOMA art. YESY FINALLY you spoke out about your current projects! 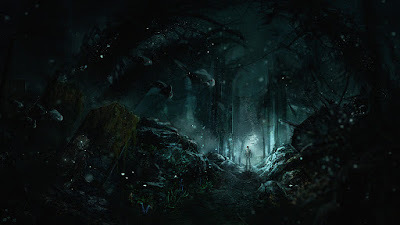 I can't wait for this new visceral-horror game, about time we got something shocking in that manner after two (mainly) story-ridden games in a row, that are SOMA and AMFP. I've actually played and completed SOMA only a few days ago, after whole two years of attempting to, because I really disliked the sci-fi theme and setting. But putting my personal preferences aside, SOMA was no less a masterpiece than A Machine for Pigs. Unlike most people, I loved AMFP and I'm obsessed with it to this day, full 4 years after the release. But still, I have to say that I'm excited that the next game will be more terrifying visually than psychologically, like The Dark Descent was. Can't even imagine what "illness" you guys came up with, can't, wait can't wait! Keep up the good work, all the best, love y'all!! This kind of transparancy is a mark of quality producers. Good to hear that you made and are still making profit - ain't that the most important thing these days! I bought your games after watching through SOMA on Youtube, even if I didn't play the masterpiece on my own (played the other 3.5 games of yours though!) You are one of the best indie studios to ever grace the games industry! While I am personally a huge Lovecraft fan, I also feel wary against using the Lovecraft mythos directly. What I loved about the books when I first read them was that all was so strange and unknown. Nowdays the lovecraft creatures are so well known and, sorta paradoxically, I don't think you can create the proper Lovecraftian feel with them. So therefore I think it is better to do something that is Lovecraft-inspired rather than using his work explicitly. Well, this might be very hard criticism to take, but while the engine suits Amnesia, I think HPL engine held back SOMA's potential a LOT. It was extremely demanding, buggy, and the game was not looking particularly good to be honest. Don't even think a minute I'm a hater, I love the work you are doing guys for a looong time, we'll see how things turns out for your next game, but please consider Unreal Engine 4 maybe for future projects. I can understand it's hard to switch from a home made custom engine you've been working on for years now to an other one made by someone else, but UE since 4 makes things so much easier for gamers... since it's a very common engine, people can very often fix problems themselves just by tweaking settings and sharing mods and fixes. And the engine itself is a blast, you can recompile your own version for free actually if you are not totally satisfied with it. I don't think that's what FG wants to do, they want to have a bigger hold on their engine. No, please stick with HPL and its good and bug free support for linux (big thanks who ported and easy to port engine?). Shame it was buggy for you, but Unity or Unreal engine or other 3rd party ware don't have best (if have) support for my OS of choice. And looks... Game advertised with impressive graphic/looks - first thought come to mind - dev try to hide something under shiny, sparkling veil most likely just another empty shell. PLEASE, PLEASE ADD VR SUPPORT!!!!!!!!! Thanks for all!! You're my favourite developer in the world and I'm sure, this two games are going to be fantastic!! And I don't care about the others and the hater, DAY ONE FOR ME!! I blindly trust you all!!!! Thanks again!! Can you say if you plan on having these games exist in the same universe as SOMA or Amnesia (Or maybe they're in the same universe I don't know)? Will the new game (or 2nd new one) be placed in a time period like Amnesia or futuristic like SOMA? - I won 60€ to spend on gog.com and your game appeared very fast in my mind. - I prefer buying full price so you guys get what you deserve. If you ever run into financial problems consider opening a Patreon. I think you have a big enough fanbase to secure a basic monthly income, myself included. So great to get an update, welcome back. Good news on Soma, though I think this game deserves so much more. I recommend it every chance I get. Do you have any thoughts on how you can deal with the negative publicity resulting from people who didn't understand the game? For example one of the main criticisms I've heard about the game is the enemy AI is poor and not varied but this is just not true. Different enemies in Soma behave differently but this seems to be lost on some very influential reviewers and youtubers. In my first play through of the game I missed not the fact that enemies were different, but what the specific triggers were for some of them. Do you feel this is something worth addressing or are you worried about hand holding and breaking immersion? Also, after 2 years and all the feedback you've gotten, do you have some ideas about how Soma could have been marketed more effectively so that people were not expecting Amnesia 2.0? Obviously now that you have Soma under your belt you can point to that as well, but what about other solutions? Best of luck to you and your team! So long as you'll be aiming to create a powerful experience, rather than a plug-and-play gorefest horror, I'm sure we, as your audience, will stick to you and long for more titles to come. Good luck! Any chance we could get SOMA on the Nintendo Switch? Have you played observer? I'm at a part where you talk to a sexbot and her dialogue is very robotic but towards the end there's a hint of misery and consciousness hiding away but slips out. Really uncanny and unsettling. The game also has some body snatcher and repo man dark themes. What do you think of the horror aspects of the game? Have you guys considered an expansion / dlc for SOMA. I remember in the old days, i think it was Valve or someone who descripted that an expansion makes really good money. Because they have a lot of the assets already, the engine already created / improved. The programmers and artists are at their best at using the tools at the end "obviously". I think it would be silly to not see it as a good source of income, obviously only if you feel like you have something important and cool story to add. Come to think of it, it would be cool to see what Simon does once he wakes up all alone abandoned by Catherine, although that would invalidate the choice a lot of people made to just kill him. I was replaying Soma this past weekend and thought about how the Ark is sort of like the afterlife which made me think that even if there is an afterlife, whatever goes on to live in the afterlife would really just be a copy of me since it would be separate from my brain and the atoms that make up my body. Well despite of your words i've bought Soma and Amnesia exactly via Steam suggestion system. Don't underestimate it. I agree. I bought Amnesia games because of SOMA as well from the Steam suggestions. I never played your Amnesia games but once I saw SOMA on Steam I was immediately intrigued by the setting and underwater facilities. I meant to just try it out, ended up playing 6 straight hours. I just couldn't stop. It was like a movie you can't take your eyes away from. I bought SOMA on PC , but honestly had some problems with it and never was able to finish due to glitches. I was happy to see you ported it to the PS4 which I happily purchased a second time, and was able to complete the game a year later. The ending is the epitome of my peak interests. The whole game, rather. Consciousness, the horror, speculative origins of the mind and how it works, futuristic sci fi. Also.... walking on the ocean floor is an incredible feat that I'm surprised no other game has done before. Truly crazy experience like no other. Excellent Job, Thomas! Oooh! It's Everywhere! Frictional Games is a small game company located in the dark depths of Sweden. We are the creators of Penumbra, Amnesia and SOMA. Followers are visible to the blog's administrators. Analytics do not store identifiable data. Comments are powered by Blogger and processed by Blogger.